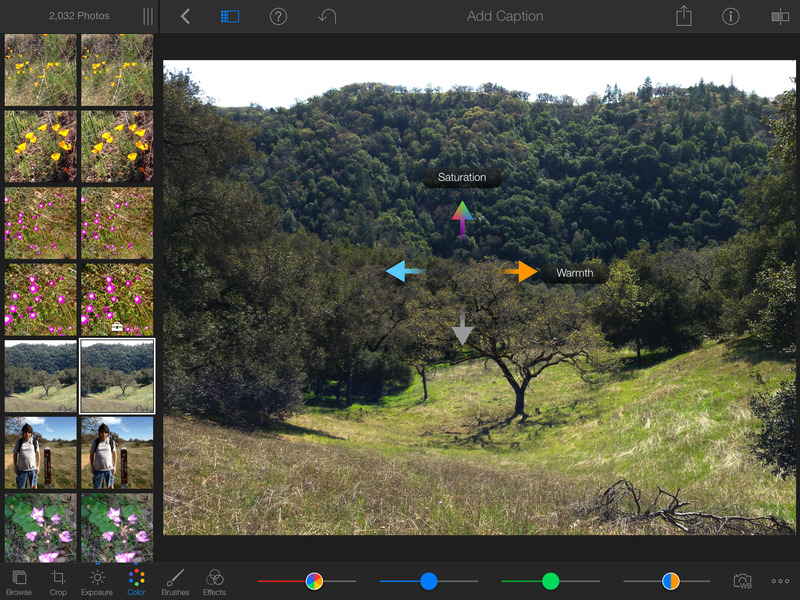 New versions of Apple's signature consumer photo editing and management software—iPhoto for Mac and iPhoto for iOS on both the iPhone and iPad—have been updated with fresh enhancements to emphasize iCloud integration and 64-bit compatibility alongside its debut of OS X 10.9 Mavericks. While Apple has been more active on the mobile side of iPhoto in recent years, the Mac version, which now shares a database with Aperture, is still the undisputed iLife photographic hub. iPhoto for iOS debuted last year with much fanfare, and for good reason. It was a beautifully rendered app that, although not identical to its desktop counterpart, offered many analogous capabilities. In some ways the mobile app, universal for both the iPhone and iPad, had an even more elegant and modern interface than the desktop version. And because of on-screen gestures, operating the program was straightforward. iPhoto for iOS 7 presents a simple, elegant interface. 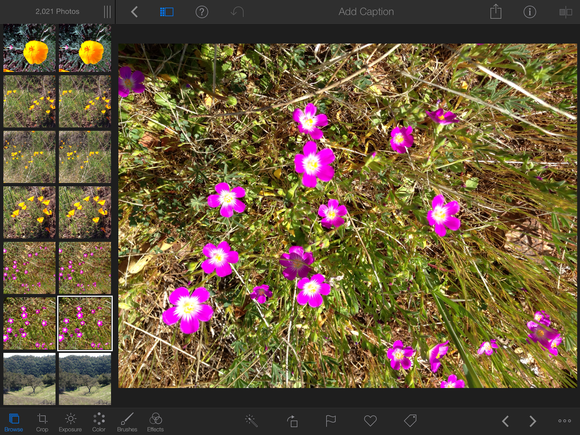 With iPhoto for iOS 7, Apple didn't exactly re-invent the wheel, but the philosophy behind the interface overhaul so altered design details that this upgrade almost seems like a brand new app. But not quite. Ironically, the opposite holds true for the desktop version of iPhoto, still called iPhoto 11, now at version 9.5. You can only get this version when you upgrade to Mavericks, and then there are still conditions and permutations on who gets the upgrade for free. While the app has a few significant new capabilities, the overall look and feel is very similar to the iPhoto 11 everyone already knows. Major components of iOS 7's new iPhoto for iPad and iPhone, called version 2, are comparable to the previous version. The opening interface presents choices for adjusting columns of photos, leaving you more or less room to work on your central image. While the icons have been updated, streamlined, and reduced in size—iOS 7–ized into thin discrete precision drawings—the functions they represent remain much the same as before. 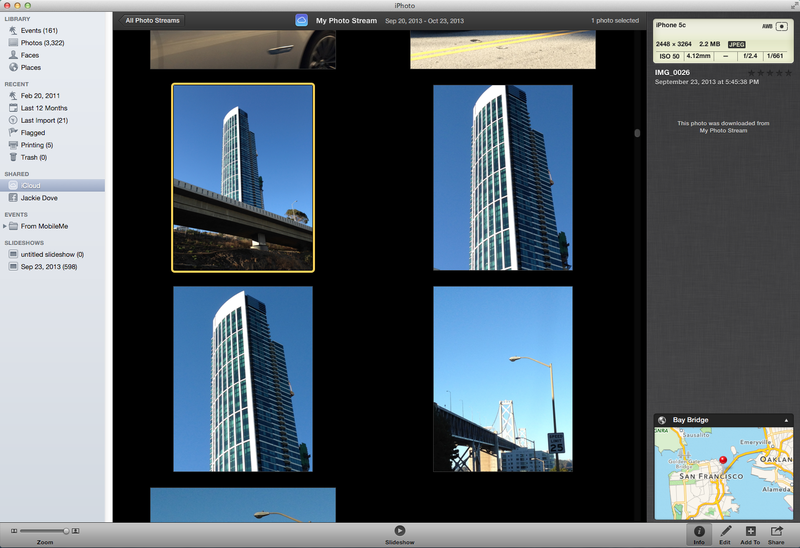 There are more artistic effects panels in the new iPhoto for iOS, but it's not the same without the fan. Browse, Crop, Exposure, Color, Brushes, and Effects are all present, though I must admit that the presentation of some of the settings are perhaps a little less charming and whimsical in the current version. Call it skeuomorphism if you want, but I liked the animated iOS 6 effects fan and the brushes spread; it captured my eye and made me smile—it was so...Apple. The iOS 7 interface is perfectly nice, more reserved in personality, but happily it mostly operates the same way with a full complement of streamlined commands. The vast portion of features and controls were maintained in the iOS 7 version of the program, seen here on the iPad. They just look a little different. Interface aside, iPhoto for iOS also has some new things on tap. With this version you can order prints in various sizes directly from the app and create hard copy printed photo books from the Share tab. 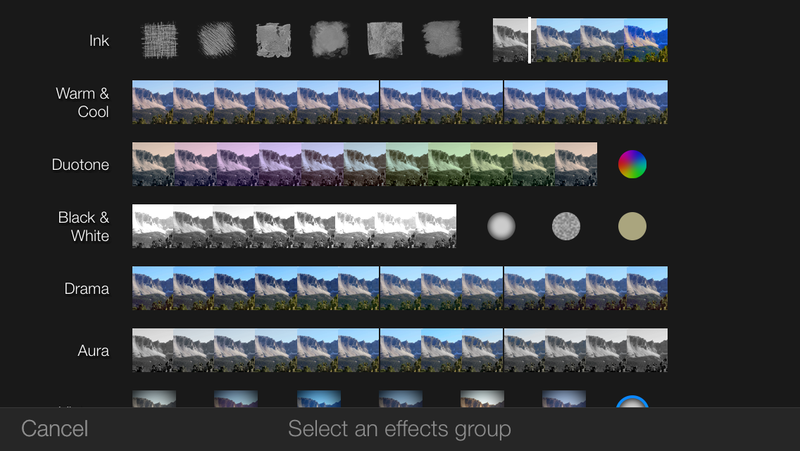 There are additional filter effects too, such as Camera Filter and Drama. All options are available without switching modes, but it took a few taps to figure out how to break free from the editing functions to find the main categories—Photos, Albums, and Projects. Hint: It's a small arrow icon on the upper left that is one of the few icons not specifically labeled by the on-call, tap-activated, exhaustively detailed help system. While we did not have the time to actually view a book ordered through iPhoto for iOS, prepping and ordering was intuitive. You can choose images ahead of time or as you go. You can interactively adjust the content of books as you build them, changing the number of photos that can appear on a page, adding and removing pages, and swapping out background colors. You can build a large picture book interactively right on your iPhone. Swap out images and even edit and resize right in the template. Upon launching iPhoto for Mac in Mavericks, I actually checked the version number to make sure that I was using the upgraded the program—it looks that similar to the previous version. That's because most of the improvements are under the hood, starting with 64-bit support. However, a closer look reveals the Create tab has been replaced by a Share menu that gathers all features such as photo printing and iCloud sharing together under a single menu, where you'll also find the familiar options to build photo books, greeting cards, calendars, slideshows, and albums. The Places feature now uses Apple Maps, which hopefully is a recommendation for an improved product in Mavericks, and I found the geotagged images from my iPhone to be mostly accurate. Aside from a long list of bug fixes, there are relatively few new features in the Mavericks version of iPhoto. If you're into Cloud-based photo sharing, you can now post videos to shared photo streams and have friends and family contribute as well. 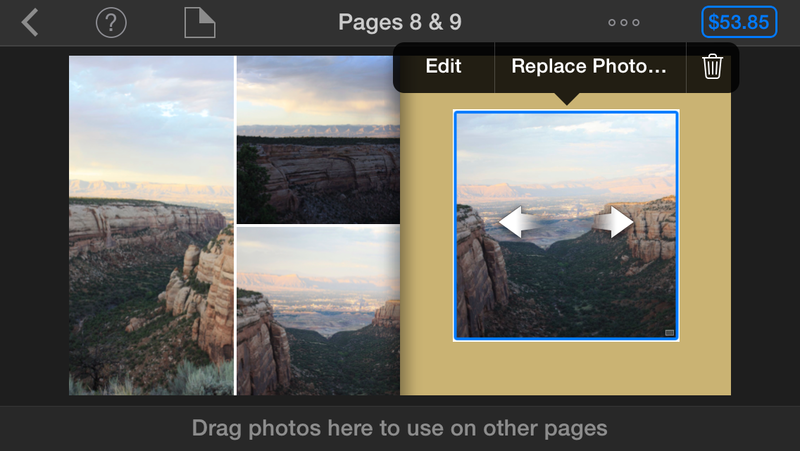 The most radical visual revision to iPhoto comes to the iOS version, and the changes are mostly visual. Old hands with the Mac program will find their way around as they did before. iPhoto 9.5 has a number of solid improvements to recommend it, but its aging look and feel will surprise and disappoint some users.